This post is sponsored by TripAdvisor and contains affiliate links. There's a possibility I could earn income when you click through one of these links and sign up for an account, make a purchase, etc. This article is written for entertainment purposes only and should not be construed as financial or any other type of professional advice. When contemplating saving and investing money (rather than spending immediately), typically, I'll consider a specific purpose and timeline. If unsure exactly what my future life will look like, I can use these financial goals as a basic guide. Brainstorm and write down what I really want to do. I may have a few things in mind to start with so it makes sense to go ahead and write these down.At this point, I don't worry about whether I'll accomplish every item on my list or whether an item seems list-worthy. The more intentional I can be about setting and achieving goals, the more likely I'll succeed. 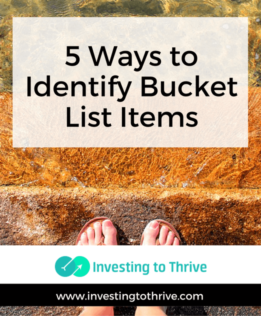 Your list may look much different from mine, depending on your interests and stage of life. The important thing is to consider goals and dreams, whether short-term, long-term, highly attainable, or seemingly out of reach, and document them to provide guidance in making decisions and taking advantage of opportunities. Ask friends and family about their bucket lists. Hopefully, my friends and family have a few things (or more) that they hope to accomplish in their lifetimes. I don't need to duplicate what my friends or family members are doing, but I may become inspired by their goals.Plus, I may discover that their aspirations mirror mine and we can work together to mark off bucket-list items. For example, if a friend wants to run a marathon, we could train together. Alternatively, I may find that a friend has already accomplished a mutual bucket-list item and I can get tips from her to help me reach my goals. Check out travel and adventure websites. Generally, when I think about bucket lists, I think about travel, generally to an exotic location or one that has opportunities for adventure.For example, a few years ago, for our 25th wedding anniversary, my husband and I took a cruise to Bermuda. This trip ticked off a couple of items on my list: 1) go on a cruise; and 2) visit Bermuda. You likely already have places you'd love to travel, if you had the money and time. But if you need inspiration, consider general travel websites such as TripAdvisor, which allows you to find adventure vacations worldwide and get insights about adventures you may be considering such as canoeing in the Boundary Waters or hiking up Half Dome. Since I have some special interests, I might find bucket-list recommendations based on my hobbies. Runners may consider big city marathons; backpackers, one of these treks; or literature lovers, landmarks like these. There are several takeaways from the movie that apply to developing my own bucket list: 1) I'm never too old to make a bucket list; 2) my bucket list should represent what is meaningful to me; and 3) though certain bucket list items are costlier than others, I shouldn't eliminate a dream just because I'm not sure how I'll get the money to cover my list-related expenses. I also picked up a few new ideas. One that sounds intriguing is cycling down the Danube Bike Trail (#26 on Marelisa's list). Another that I had considered more of a personal goal is to write and publish a book; somehow, putting this item on my bucket list makes it sound more appealing. Plus, it gives me the license to fund this project just as I would fund an overseas trip. Finally, I discovered there were interpersonal items that cause me to consider goals not related to travel, fitness, or career development. Many folks have set goals that involve interactions with other people; for example, they want to serve as a mentor, throw a surprise party, or teach someone to read. These may take time but likely do not cost as much as epic trips. Accomplishing these things-I-want-to-do-before-I-die may require cash or large expanses of time. Planning, along with saving and investing, can be useful. In a companion post, I'll discuss ways to fund bucket-list items. In the meantime, go make your bucket list (here's mine).